Overall, I really enjoyed reading this book. I have a few minor points against it but all in all, this is definitely worth your read. What I especially liked right from the cover of the book is that it is unique and not really what I expected a book about living a great life would look like. This unique style stems right from the cover through to the text throughout the book and I am quite happy to have read it now. I am certainly not a cowboy myself even though I am often out riding horses with my wife. 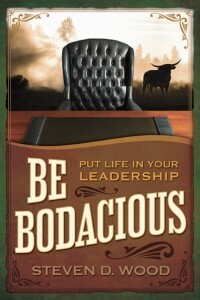 What I found funny was the moment my wife saw the book, she instantly said, “Hey, Bodacious is one of the toughest bucking bulls ever, why are you reading a book about that?” I had no idea this had anything to do with the book, and was pleasantly surprised to read about the bull, Bodacious in one of the early stories and to learn my wife was right and knew about him already. I’m not surprised though, as she does love to watch the bull riding on TV. Anyway, the book is about stepping up to take life on by the horns (pun intended) and to do more than sit around and watch it go by. Its about being bodacious and bold in everything you can and to make the most of yourself in life. I especially enjoyed the stories told and then that each of the life lessons are learned from these short stories and they are easy to remember and easy to relate to. The book itself is quite short and an easy read in 2-3 hours. It has important leadership lessons to learn from and is told in a way that it inspires you for your life to not settle, but to put your life and leadership together. The one thing I didn’t like about the book was that a few of the stories and way the stories are referred to become quite repetitive and the language used seams a bit childish. Looking past that though and the lessons presents from the stories brings it back to the mature topic of life advice. These secrets are expressed as the keys to taking grip of your life, leading things to move in the direction you want and to find the dreams you want in life without having restraints in life to limit you. Each of these secrets are explored with specifics and story examples that make it easy to connect with, which is why the book does it’s job so well. Each chapter has a summary of its main points about these bodacious secrets and you can easy use these summaries as reference and highlights coming back through it again later. I’d definitely recommend checking this book out for anyone interested in leadership and especially for those wanting to expand their own lifestyles and lead themselves towards the dreams they have always wished they could have and fulfill. I heard about this book. I am going to pick it up this week. I have been involved with horses and ranches since I was little. I like how in the reviews I read that the book is a quick read but full of great examples. Ya, you will definitely like it then and its only about 160 pages. Well worth reading for a short study of leadership and life I’d say. Katie, that is exactly where I just read it myself with a trip down to Houston. The stories in it are easy to keep your interest, despite the usual airplane distractions. I hope you enjoy it. Thank you for being bodacious enough to take part in the Book Review Blog Carnival, mike. This is our 50th edition. Anyone who writes book reviews on a blog can participate. The 51st will be published on September 5th on my blog.